Time to harvest and savour the fruits of our labour! we have now lifted most of the early potatoes - Nicola and Charlotte - wonderful waxy, new potatoes, tasting just like I remember new poatoes from my childhood. If you want to grow something that tastes really different from anything you buy in the shops, grow potatoes. The ground we cleared by lifting potatoes is home for my autumn leeks which I have now transplanted. Using a dibber to make holes about 8 inches deep, I just dropped in the young leeks and then watered, leaving room for the leeks to expand and for the holoes to fill naturally. They look good now but they will need regular hoeing and hand weeding if the summer weeds are not to take over. And the cucumbers are just getting the hang of climbing up the netting! They are slow learners and seem to prefer to trail on the ground! ....and the competition with Maurice is on! Another great success on the Weald has been the chard. 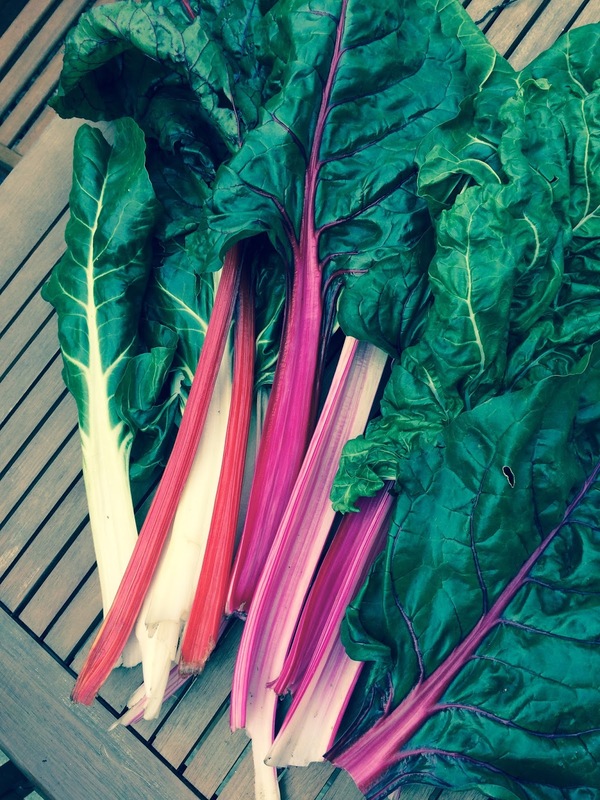 I had sown some rainbow chard from seed and also some Spanish Swiss chard (or silver chard) from a pack of seeds I had brought back from Spain, but there also seems to be a lot of self-seeded red chard on the plot which is quite prolific. There is so much that we have given loads away, frozen some, eaten it daily, put it in soups and curries and are busy exploring recipes for different things to do with it. The plum tree which we inherited looks as though it will give us an abundant crop this year but is showing some signs of leaf disease so we must think about spraying it this autumn. But whilst we are gloating about the success of our crops and relaxing in the sunshine, there is some hard work to be done if we are to get the shed up before winter!